ACRP Training and Development is currently revising the curriculum of the prep course for the NEW Certification Exam which will go into effect in January, 2017. Check this site frequently for updates. LECTURE PowerPoint Slides: Handouts of lecture slides and additional course material will be distributed during class. Instruction: In English. Q/A: English or Mandarin. This ACRP prep course will be offered at two (2) locations for the March 2015 exam. 台北榮民總醫院, 台灣台北市北投區, 石牌路⼆段 201號, 中正樓16樓，神經內科會議室。 The Conference Room, Department of Neurology, 16th Floor, Chiang Kai Shek Building, Taipei Veterans General Hospital, No.201, Sec. 2, Shipai Rd., Beitou District, Taipei City, Taiwan 11217, R.O.C. Please see Online Registration at the end of this announcement. Once your registration and your payment are complete, your Registration and Class Location will be confirmed by email. Should cancellation occur due to unforeseeable circumstances, ACRP will refund the participants. Trainer: Benny Fok, PhD, CCRC (霍兆邦博士, 香港中文大學內科及藥物治療學系臨床藥理學科研究科學主任), Scientific Officer, Department of Medicine and Therapeutics, The Chinese University of Hong Kong. ACRP Approved Certification Exam Preparation Course Instructor. Course Description: This ACRP Certification Exam Preparation classroom course provides guidance on how to prepare for an ACRP Certification exam (e.g., CCRA®, CCRC®, and CPI®) to candidates eligible to take the exam. Familiarize yourself with the format of the exam, tackle example questions, and conduct a personal gap analysis to ensure you are fully primed to earn your ACRP Certification. This classroom course was prepared by ACRP experts exclusively for Chapters to offer locally, and is taught by a trainer approved by ACRP to teach this course. It includes PowerPoint presentations/hand-outs, interactive classroom exercises, discussions and question-and-answer sessions. No contact hours are offered. Target Audience: Eligible candidates for the CCRA®, CCRC®, and/ or CPI® ACRP Certification Exam. About ACRP Certification: Applications accepted: Applications for the March 2015 Certification Exam will end February 1, 2015. The next exam date will be September 2015. ACRP Certification, administered by the Academy of Clinical Research Professionals (the Academy), is the formal recognition of clinical research professionals who have met eligibility requirements and demonstrated proficiency of specific knowledge and job‐related skills by passing a standardized exam. ACRP Certifications are relevant for all research studies involving human subjects, including, but not limited to, drug, device, and biologic studies. Earning and maintaining your credential demonstrates that you have achieved the clinical research profession’s “trusted mark of excellence in clinical research”. This career milestone validates your clinical research knowledge and skills, and the ability to apply those in your daily work. The CCRA®, CCRC®, and CPI® programs are accredited by the National Commission for Certifying Agencies (NCCA). The online registration is now closed. Thank you. Please check back often for more upcoming events. Click 2014 Symposium Program_V13 to download a printable program brochure. Quality of clinical trials is deemed paramount by the regulatory agencies for the protection and welfare of human subjects and patients. As more and more global trials have moved from the West to the East, especially to China, CFDA as well as the FDA have geared up their monitoring and regulatory effort. This session presents several practical considerations from CFDA/CDE experts and their point of view about the China clinical studies, as well as some practical experience from China’s local industry. 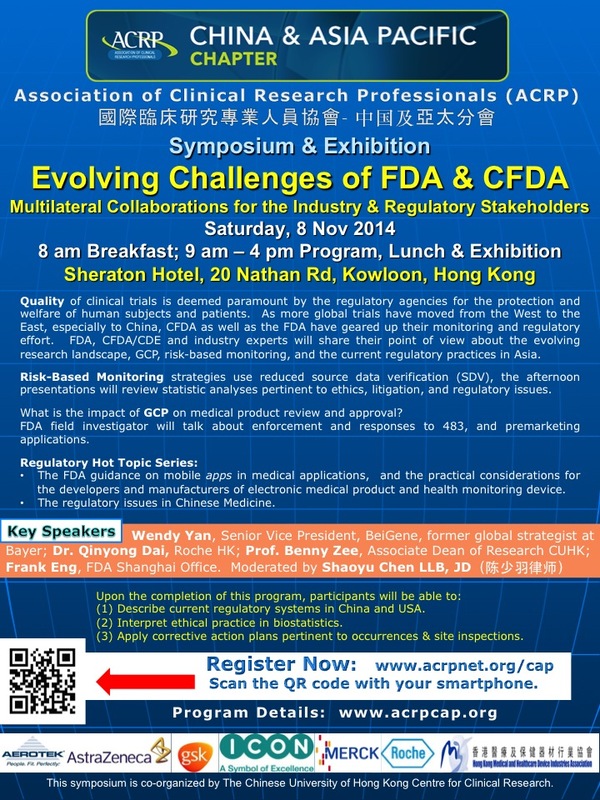 Strategy in Drug Development – From Roche Perspective Dr. Qinyong Dai Medical Director, Roche Hong Kong Limited Current Regulatory Practice in China The certification and registration of medical products with the CFDA can be an extensive and drawn-out process. A large number of documents, specifications and reports must be provided and intensive on-going communication with the certification bodies and testing laboratories is needed. Conducting the registration from overseas can be more difficult due to communication problems and the changes that may arise regarding the requirements of the regulatory bodies. Get informed about the CFDA certification process and all its single steps by an experienced industry insider. Biostatistics informs the Food and Drug Administration’s regulatory decision-making processes for premarket review of investigational drugs and devices and post-marketing surveillance of medical products, including decisions to require safety labeling changes and withdraw approval. The efficiency of the whole clinical trial data process cycle of collecting, analyzing and reporting data was influenced by multiple factors. This presentation will discuss the effort of data standardization, data quality control and assessment through risk-based monitoring and fraud detection, and the data analysis automation and visualization on the clinical trial study. Many industry insiders do not fully understand the recent guidelines from the FDA, ICH and other professional authority. A SAS specialist will discuss statistical analysis pertinent to ethics, litigation, and regulatory issues. Dr. Wenjun Bao, Chief Scientist and R&D Manager for JMP Life Sciences of SAS Inc.
Bioresearch Monitoring Program (BIMO) – the protection of research subjects and the integrity of research data in support of marketing approval. Recent trends in BIMO inspections of clinical investigators, IRBs, sponsors, and CROs. Key strategies for responding to FDA 483s and Warning Letters. FDA guidances & the regulation maze: practical considerations for the developers and manufacturers of electronic medical products and health monitoring devices. Five CME and ACRP contact hours have been applied for through ACRP Global Headquarters. Membership is not required for online registration/application of contact hours. Updated information will be posted upon approval. 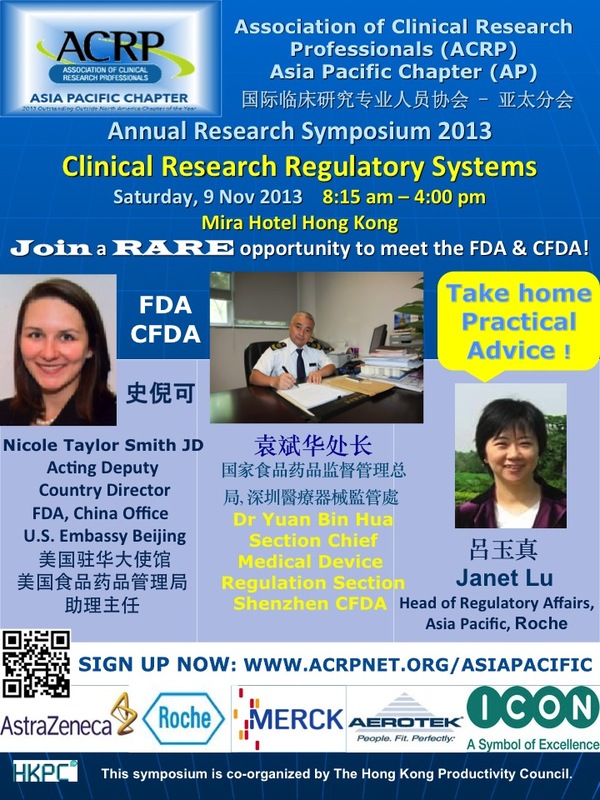 Please select one of the 3 methods to register for the ACRP clinical research symposium. Please register early to reserve your space. Deadline for online / wire / mail registration: Oct. 31. (1) Online registration (Due to Singapore regulations, Singapore users please use Option 2 or 3.) To register online, please click on the appropriate Buy Now button below. PROPER IDENTIFICATION IS REQUIRED. Please bring your email confirmation to the event. Terms and Conditions1. Registration is confirmed only upon receipt of payment. All successful registrations will receive a confirmation from ACRP-China & Asia Pacific Region via e-mail. ACRP reserves the final right of decision if there is any dispute.Cancellation Policy: No refunds are made upon confirmation. Substitutes are acceptable with written notice to ACRP-China & Asia Pacific Region at least 3 days prior to the event date of November 8, 2014.